Unlock more In-Game Rewards with HeroPoints! Stop by HeroMart in Battleon! Talk to Stryche to see all of the rockin’ rewards that come with any real-world HeroMart purchase, and learn about our new points system, HeroMart’s HeroPoints! The in-game location opens THIS week for you to explore. The HeroPoints in-game currency will go live later this month! Heromart is about to ramp up production, with many new posters, shirts, and other gear coming in the near future! All those items will come with HeroPoints, so keep an eye out for new merch! HeroPoints are a new way for you to get even more rewards when you get merchandise from HeroMart! 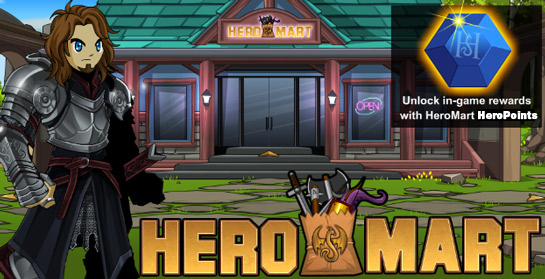 Existing store items will keep the codes they currently use, but from here on out, select HeroMart merchandise will come with a quantity of HeroPoints that you can spend in Stryche's in-game merge shop. We are currently planning to introduce new in-game items in the HeroPoints Shop each year, and retire old items. And more to come in the future! You'll see variants of many existing HeroMart in-game rewards in the merge shop. If you bought a HeroMart item that unlocked the original versions of these itms, you will also get the variants for free in your badge shop. HeroPoints will only come with select future merchandise, as all current merchandise already comes with exclusive gear!